I came back a day early from my Málaga Getaway this week because I had been invited to a gastronomy event on Tuesday that I simply couldn’t miss, featuring the dream team of Tribeca and Cañabota cooking together. It was to be one of the most unforgettable meals of my life … but I am getting ahead of myself. I’ve known Cañabota since its inception two years ago, when Juanlu Fernández joined forces with Pablo Giménez and Eduardo Guardiola from Tribeca. The latter I finally got to know in person when friends invited me to join them there for dinner earlier this year. So I was very keen to see – and taste – what they would come up with together. The event was held at Tribeca and when I arrived with the other lucky guests, we were taken downstairs to see the various fish and seafood that were to become our lunch, and were given a lecture on the sustainability of fishing by Eduardo. Then it was back upstairs for a masterclass in the breaking down of a fish, in this case a 15.2 kilo grouper, showing how every piece is used and nothing is wasted. And then it was time to eat! 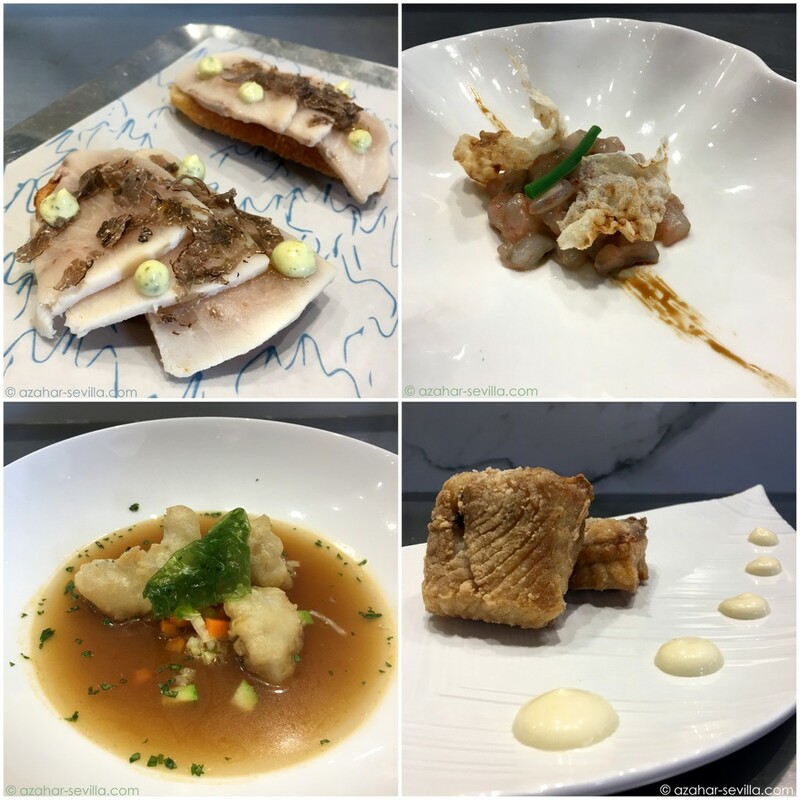 The menu was a bit like a “showdown” with both teams creating different dishes using the same main ingredient (prawns, sea anemone, squid, grouper, skate…) along with a couple of joint efforts. Each dish was paired with well-chosen wines, including two manzanilla sherries to start off with, then two white wines (Albariño & Priorat), and moving on to two reds, dry (Mallorca) and sweet (Alicante). The food was spectacular, and my only complaint was that there was just too much of it to comfortably finish all the dishes (luckily a friend sitting next to me was happy to help out). And while I appreciated the more clever and complex dishes, my personal favourites were the ones that were the most simply prepared, either lightly steamed or chargrilled. But it was all wonderful. Of course the service was impeccable and the overall experience was one I will always remember. 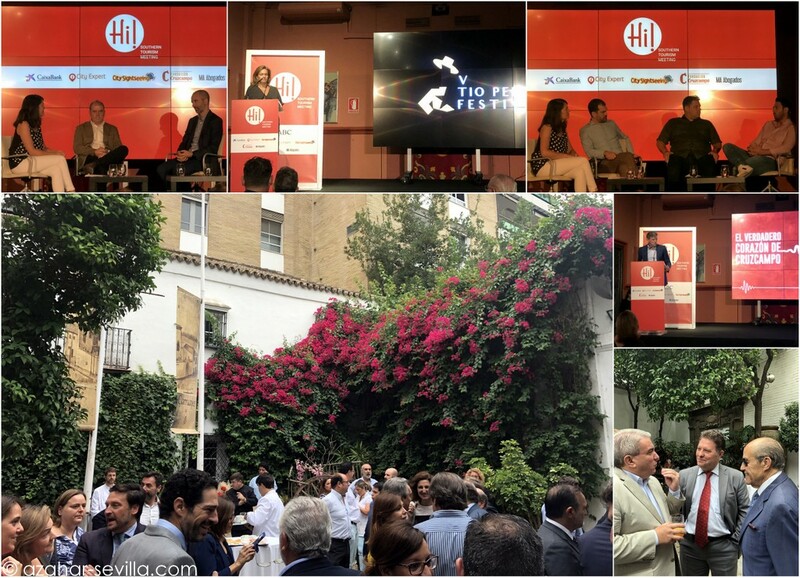 One of the perks of the biz is when I am invited to previews and openings of new bars and restaurants in Sevilla. I was excited to hear the other day that the long-awaited arrival of Cañabota will be realized this coming Monday (October 17th), and I was very lucky to be one of the guests at their fabulous preview lunch. 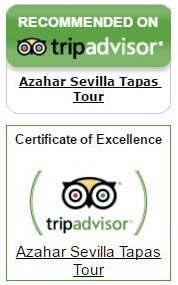 Much more coming up very soon on Sevilla Tapas. Preview tasting menu: “solid cocktail” of Hidalgo fino, Lustau vermouth with trout roe and orange zest; grilled oysters with toasted butter and artemia; onion crisp topped with larded tuna, onion purée and tuna fat; cod liver salad on mushroom slivers, baby spinach and lettuce, fish emulsion and spicy vinegar; squid ink potato parmentier with cuttlefish roe and chipirón; sea bass with confit black trumpet mushrooms and fish emulsion; lemon meringue “pie” on a crispy biscuit.